In moving from Black History Month and through Women’s History Month, it is tempting to focus on thoughts of Spring, and forget a cold and stormy winter. It is also easy and convenient to forget the hard-won challenges, the sacrifices, and the often-hidden accomplishments whose memory have been squeezed into two of the coldest (and one being the shortest) months of the year. Yes, it is easy and convenient to forget from where we came, and forget what we came through; but recently I attended a meeting led by three people who remembered not to forget; and also committed their expertise, hearts, and souls, to creating and expanding opportunities for others. On March 18th, Dr. Constance Longmire, Dr. Jalil Mustaffa Bishop, and Ms. D Milburn, unveiled the Community L.E.A.P. 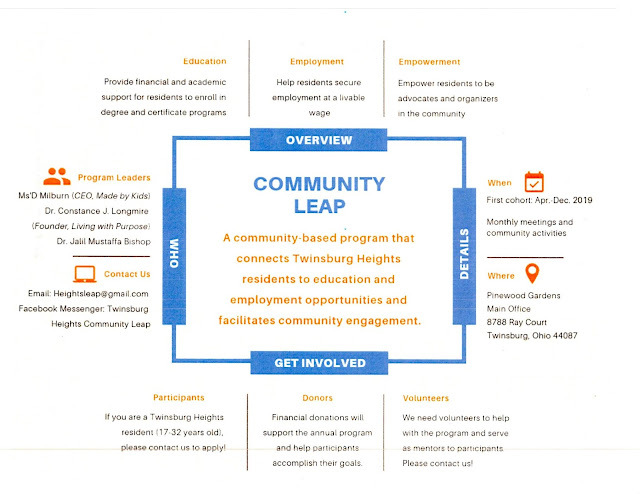 (Leadership - Education - Achievement - Purpose) program to a group of mostly Twinsburg Heights, Ohio residents. A common thread connecting the three is having grown up in Twinsburg Heights. Each of the three has achieved excellence in their professional life, and could easily have taken the road often traveled, where one puts on blinders and earplugs, and escapes the challenges and concerns of the neighborhood they left behind. But each chose instead to come together with their expertise and passion, and help sow seeds of opportunity for others. The three, along with others such as Filmmaker Carla LynDale Bishop (formerly Carla Lyndale Carter) and Hubert Brandon, give back to the community in ways that strengthen and inspire. 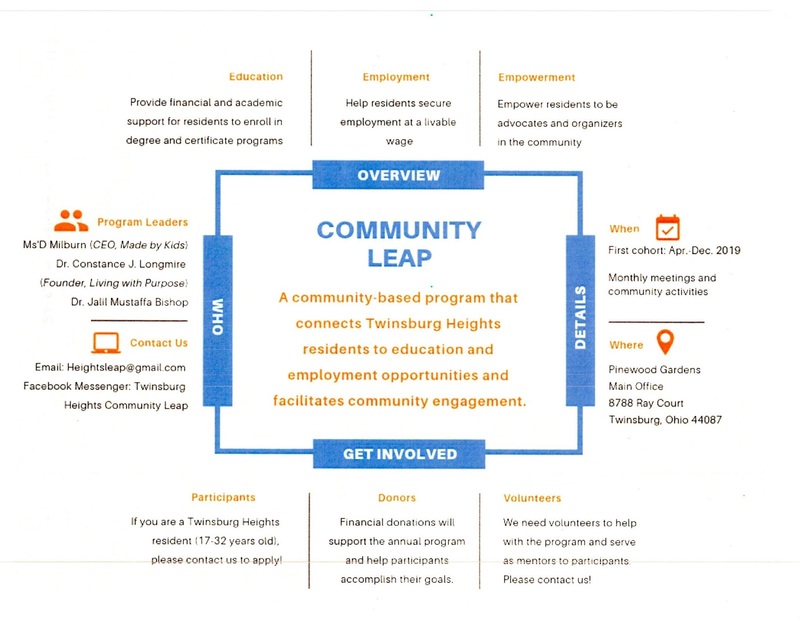 Their commitment to making a difference has already drawn the attention of other successful former Twinsburg Heights residents. Among them is area businessman Keith Harris, who took time from a busy schedule to be in attendance, and also committed to be personally involved. Also supportive of the L.E.A.P. program, are twin sisters Brittani and Brandi Jackson, former Twinsburg Heights residents and star students in Twinsburg. They are committed to inspiring the next generation of physicians, and recognize the L.E.A.P. program as a valuable tool in that effort. For additional information on the program, please email: heightsleap@gmail.com.